I (self) published my first book! | The Tales of Missus P.
Delia Bright has just started seventh grade. Now that her best friend, Travis is on the track team and her parents are busy at their restaurant, Delia is lonely. When she meets Fern, Irene, and Agnes, they realize that Delia’s baking abilities are just what they need to create perfect spells. Delia’s gift has hurt her family in the past, but she’s too curious to not bake her magical cupcakes. So, here it is! My book! This is the first in a series of young adult novels for middle grade readers. We wanted to get it published in time for Halloween, so Wednesday afternoon Steve finished up the very last image and I uploaded it to Smashwords and Amazon. We’ve been working on this together for a while now. I started writing it last Spring so once I had the first draft, we could get the illustration ideas down, then there was a lot of editing, polishing, and formatting to go through. I’ve been very excited to get the project out the door but once I did it felt weird. I was in two minds whether to even tell my Facebook friends about it because that’s criticism from people I’ve actually known my whole life. But when I posted the link, saying that Steve and I put the book up online, they were proud of me. I think they even thought I was published, and then I felt guilty, as if I’d tricked them somehow. But then I realized I shouldn’t. We did an awesome job and we specifically wrote this for self-publication. Everywhere I looked, Writer’s and Artists included, said not to submit a book with illustrations in to an agent. Publishers like to choose an illustrator themselves, according to them. The whole purpose of our project was for us to work together and when we found out we could publish ourselves online, we went that route. Still, once that book was online, I felt nervous, sick, anxious, you name it. I’m now in the club of self-published writers. I have to market and promote (without being a pain in the rump, of course). This is a whole new territory. Before the book is online, I was able to sit back comfortably and be on the side-lines. I’m the kind of writer who likes keeping things to herself until absolutely necessary. Now I’m here, looking at swapping book reviews and creating giveaways. I like it though. I’m promoting something I really enjoy doing, so it’s all worth it. Now I am working on the second book in the series for NaNoWriMo and our next step is to get this first book available in print on CreateSpace this month. I’m really happy to be in the ranks of the rest of my indie publishing authors whom I’ve talked to so much over the years. It’s amazing how much we can do these days with a computer and a big imagination. 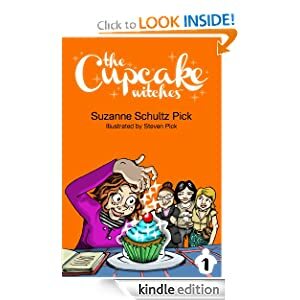 This entry was posted in All About Me, Books, Publishing, Writing and tagged Amazon, authors, ebook, fiction, Kindle, novels, self-publishing, smashwords, The Cupcake Witches, writers. Bookmark the permalink. 5 Responses to I (self) published my first book! Wow, you really did it! Many congrats, Suzie! Congratulations!!! Sent mine to the printer today so I totally understand the excitement! Thanks and congratulations to you too! That certainly is exciting! Yay!!! That’s awesome! GO you!! !